I clearly remember my first chocolate-covered strawberry experience. My mom and I were at the mall (Greengate Mall to be exact, for you Pittsburghers), and just about to go up the escalator to the next floor. I imagine that it was in Hornes (remember Hornes turned Lazarus turned Macy’s?) and they still had candy counters inside the department stores. There was no one at the counter, but there was a dish of chocolate on the counter. My mom got so excited and grabbed one for each of us, and I couldn’t understand why. I even declined it. She looked at me like I had 6 heads and told me it would probably be the best thing I had ever tasted. It was not a fresh dipped strawberry either. It was one of those fully-covered chocolate ones that was dripping with sugary syrup. It really was one of the best things I had ever tasted. I can still remember eating it with the syrup dripping down my chin as I was riding up the escalator. It’s not a cheap addiction either, especially when you prefer Godiva. Years later, I tore a page out of Better Homes and Gardens (yes, Tony Soprano-style) while in the doctor’s office. It had an array of dipped strawberries, but no chocolate ones. Is there a better way to eat your fruit? I truly believe in making food as fun and enjoyable as possible. Marshmallow cream and peanut butter. Honey and freshly cracked black pepper. Marshmallow cream and crushed cookies. Peanut butter and crushed cookies. 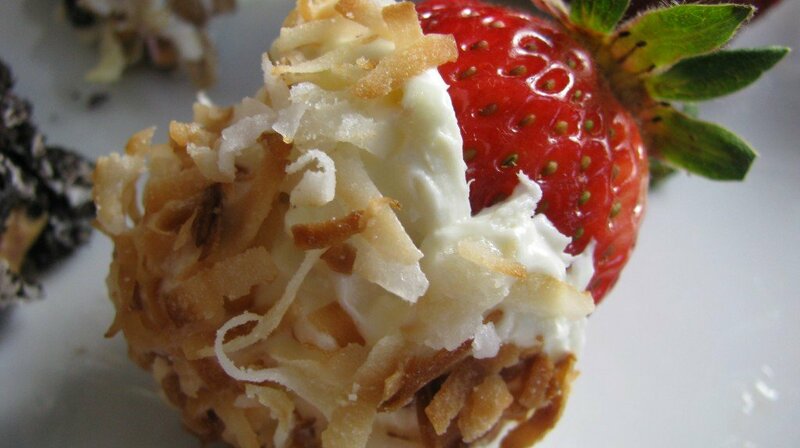 Cream cheese frosting and toasted coconut. And since these are strawberries, they are healthy. Don’t forget to check out my post on Whirl! I want, I want. I am so intrigued by the honey and black pepper one…so much so that I’ll MUST try it next time I have strawberries on hand. I’ve never NOT liked anything that you’ve created. These are so different and creative. The crushed cookies and cream one looks lush! 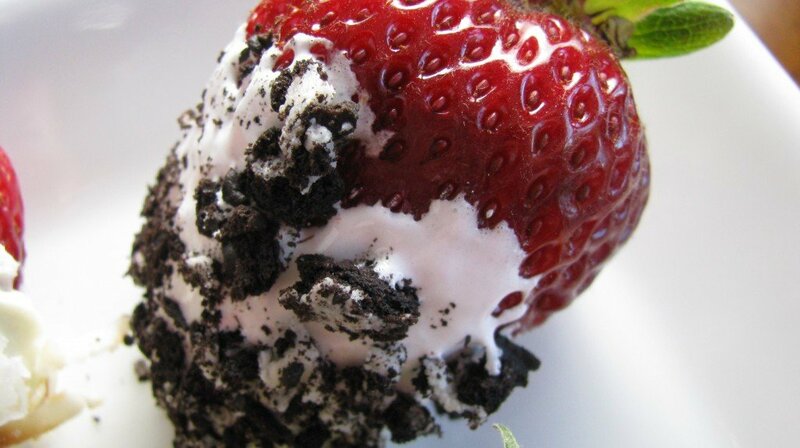 I love the way you take these strawberries to the next level! My best ever chocolate strawberries was from Lammes Candies in Austin, TX. http://www.lammes.com Btw, my husband wants to shout go Steelers!! LoL Also your strawberries look delicious!! Pepper?? On a strawberry??? Are you on crack?? Correction: is Eddie drugging you at night?! I don’t get this combination. Which means I will probably love it. 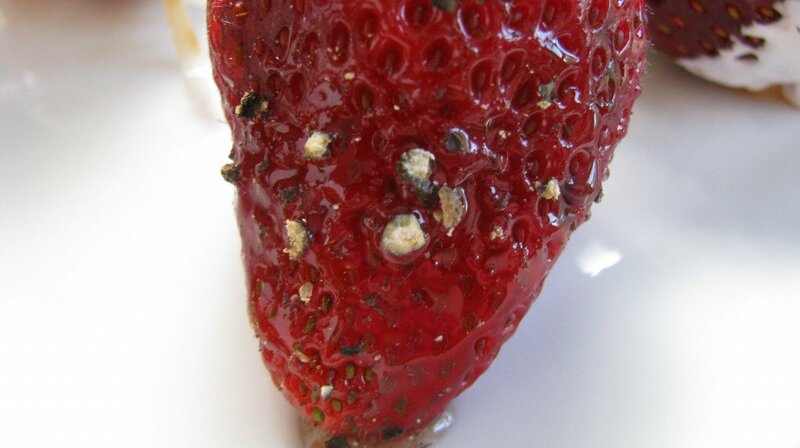 I love the black pepper one … strawberry peppercorn is one of the best desserts I have ever had. It is served on top of vanilla ice cream. you can come live with me in SD anytime :) we can train together and go out on the prowl together LOL Men and children will be left at home! haha! Wow… as if I didn’t love you enough already, you go and pull out THIS! Im in for these this weekend. I have a huge container of dipping strawberries (is that what they are called? with the longstemthings? :)) in the fridge and a party to go to on monday! the child will love helping. 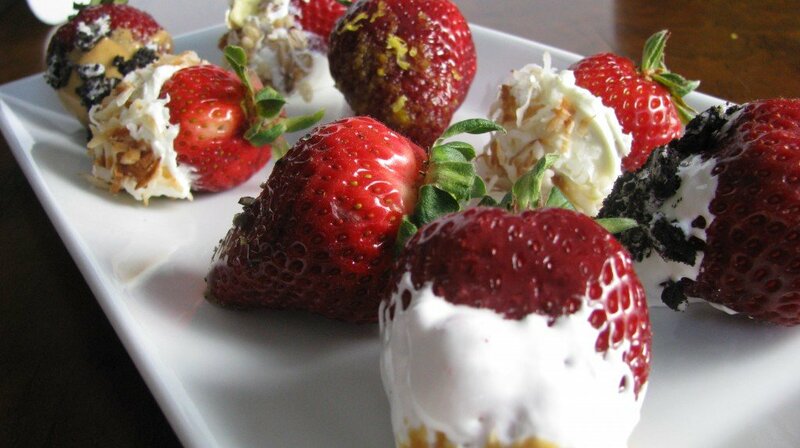 Those dipped strawberries look awesome! Love your creativity! Great ideas!!!! Thanks for sharing. Amazing! 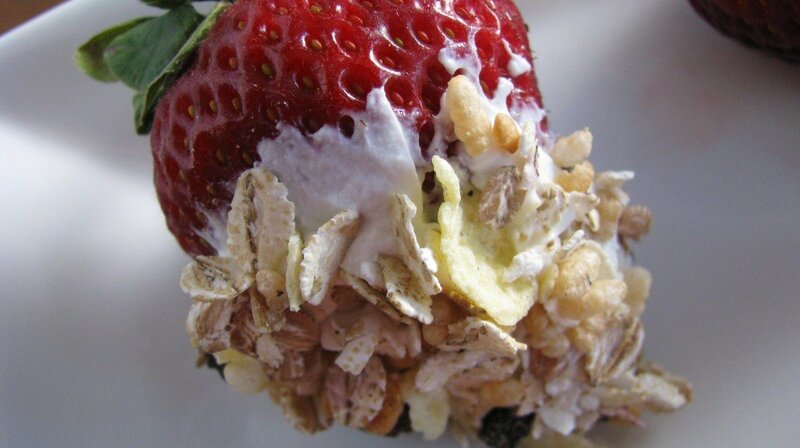 I have never seen so many different strawberry toppings (or dippings?) before. They look incredible. Wow…that is brilliant! How fun for a party! 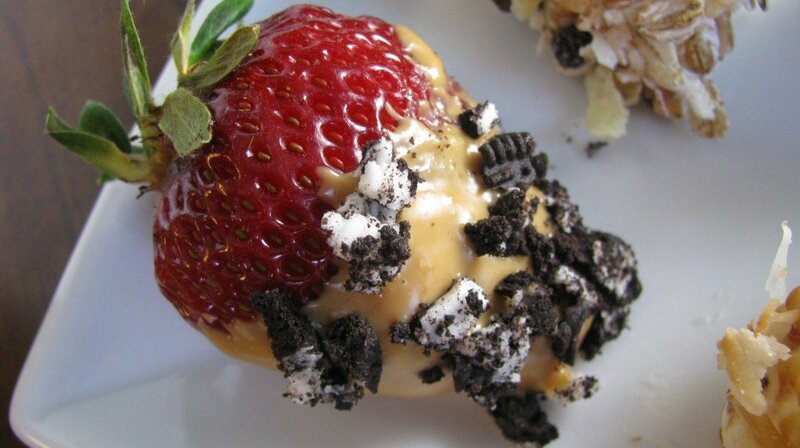 I love chocolate dipped strawberries. Those are some great ideas. Just purchased a quart of the sweetest strawberries. They’re waiting in the fridge for some special recipe. I think quite a few of them will wind up dipped in cream cheese and toasted coconut. Very creative ideas! Thanks! LOVE THIS!! 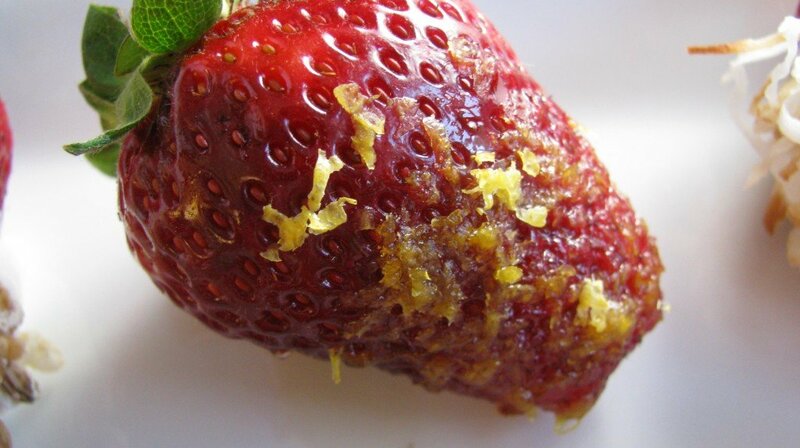 I love chocolate covered strawberries, but honey and pepper? So gourmet and elegant! hello!,I like your writing so much! proportion we keep up a correspondence extra about your post on AOL? I need an expert on this space to resolve my problem. May be that is you! Taking a look forward to see you. 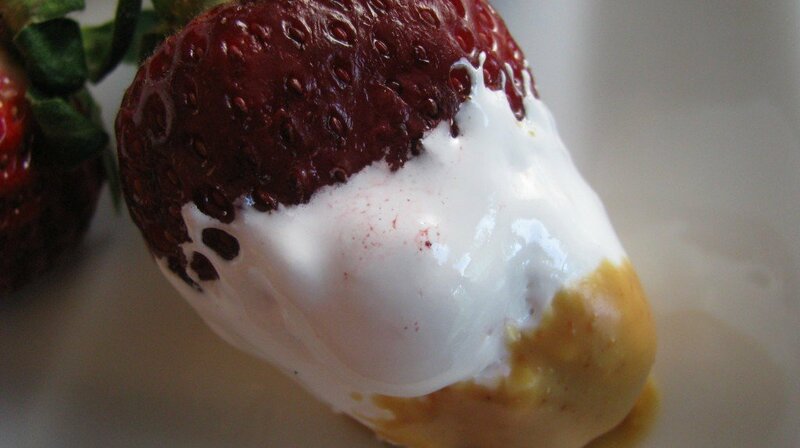 My favorite type of Dipped strawberries HAS to be Sour cream and Brown sugar Strawberries . The texture is downright sinful, and the taste is esquisite! :) Just dip in both and enjoy!